When Jesus asked his disciples. "Who do men say that I, the Son of Man, am?" Peter responded "You are the Christ, the Son of the living God." Jesus promised Peter that upon the Rock of that confession He would build His church. The truth of who Jesus is empowers common man to speak the message that opens the doors of heaven to sinners. Join us to learn strong principles for godly living and reach new heights in our faith as we work our way through Peter's epistles—writings which evangelize the lost and instruct the church. 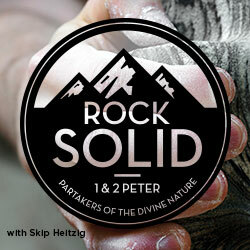 Pastor Skip Heitzig guides us through First and Second Peter in the series Rock Solid. Peter is the most famous of the apostles, even though he only wrote two short epistles in the New Testament. But of all the early followers of Christ, Peter is perhaps the most relatable to us since he demonstrates all the weaknesses and failures we see in ourselves. But Peter's personal life and his writings become a composite model of "strength through trust." Any weak, wobbly, failure-ridden person can become Rock Solid through Christ. Peter skillfully lays the foundational basis for the Christian life to his readers in a single verse. We've been picked by God, placed in His family, and promised future benefits. For anyone who has ever struggled with a weak faith, these truths can be transforming. In this introduction to Peter's letter, let's unpack the meaning of these encouraging realities. "Born again" wasn't a term invented by the popular press or religious fundamentalists. It was something Jesus told Nicodemus must happen for anyone to enter heaven (see John 3:3). Peter certainly heard that term from Jesus and speaks of it here (as well as in 1 Peter 1:23). It's a term synonymous with being saved and having eternal life. What does this new birth provide? In a word—solidity! Coming to Christ brings hope, inheritance, and power. If the trials of life could only exist by popular demand, we would have voted them away long ago. People, by and large, hate suffering of any kind. Here in the Western world, we have made it our aim to mitigate against any form of it by a multitude of distractions and experiences. There is even a theology that seeks to say God never wants us to suffer—ever. Let's look at five reasons why we hate (and love) trials, and consider how they can be used to make us better people. Rock Solid Relationship or Relationship on the Rocks? Why do we insist that having a relationship with God is not the same as being a religious person? How is a relationship with Him even possible, since He is GOD and thus is unique from all other creatures? Today, the answer to that will be made simple as we consider the simplest components of any relationship, including a relationship with God. God has always planned on saving you. You were never an afterthought or a last-minute consideration. Not only have you been chosen before time began (1 Peter 1:2), but throughout the ages your salvation has been expected and planned for. The spokesmen of the Old Testament wrote about Jesus’ coming and the new covenant of grace, which you are now a part of. All this makes our salvation more secure than ever, built on the bedrock of His promises. Holiness is an uncomfortable subject for most believers. We have no problem assigning holiness to God as we sing, “You Are Holy, Oh Lord!” But our minds get muddled when we think of our own holiness because we don’t want to appear holier than thou. So what does it mean to be holy? And how can we live holy lives around unholy people? In short, how can we be “children of light” (Ephesians 5:8) while walking in a dark world? Peter's love for his Friend and Lord, Jesus Christ, was at one time on shaky ground when he denied that he even knew Jesus. His love would even get questioned by Christ later on (John 21:15-17). But now Peter knows that love for Christ and love for His people is all part of the same package. A relationship with God includes an affection for God's people. Four components of a rock-solid love are given by the very man who learned what true love is. Babies need milk to survive and to thrive. And newborn babies need and crave it a lot. So too, those who have been spiritually born-again need spiritual milk so that they can grow and be mature. As believers grow, they will begin to enjoy more solid spiritual food. But here Peter is addressing our appetites?those things we desire and crave. He gives us a three-part instruction that will curb and train our appetites in such a way that maximum growth will be achieved. God has been building His "house" since He first made the world. This is not a physical home nor a temple of worship as much as an assembly of peoples whom He has gathered to Himself. The stones He chooses are human beings in relationship to Christ, the cornerstone foundation. Let's consider God's site-plan for this construction project today. How can Christ-followers make the most meaningful impact on the unbelieving world? That was in Peter's mind when he wrote this letter to scattered believers facing hostility from their neighbors. Four principles that transcend time stand out here; these will encourage us and empower us as we seek to influence our world for Christ and leave a lasting impression. Some people are just gifted at music or naturally talented with their hands. Others find that sports come easy, while others can perform math functions with total ease. But there is something that practically everyone finds difficult and that is submission. To abdicate our will to that of another, even for the sake of order and peace, is extremely tough. But there are higher goals and loftier purposes for believers to live submissive lives. I want to make you a promise today: If you can learn and master the four principles in our text, your job will never be the same. The tedium, tension, and labor will give way to a higher motive that will bring authentic joy and deep satisfaction. As Peter addresses slaves in the ancient Roman world, let?s apply it to a much more modern and humane situation?your place of employment. You Remind Me of Someone! Whom do you remind people of? At work or in society at large, is it evident that you are a Christ-follower? Jesus is always our supreme example for how to live a godly life in an ungodly world. Peter told us that we should submit to government as well as to management, and now he tells us why we should—because Jesus did and He's the one we follow. The most attractive people in the world are those who display depth of character and pleasant personalities. Solomon insisted that “[outward] beauty is passing” (Proverbs 31:30). As Peter speaks to a common issue in the early church (Christian wives married to unbelieving husbands), he also gives us three marks of a tenderhearted woman: in her actions, attitudes, and admiration. If life is to be rock solid, then family relationships—especially marriage—must be rock solid. No wonder Peter speaks to husbands after addressing wives. In his directive toward submission, he addresses citizens (and not government officials); he addresses servants (and not their masters). But when it comes to the home, he addresses both wives and husbands. Let's consider how a husband's love can make a woman feel firmly secure. The old saying "You catch more flies with honey than you do with vinegar" fits perfectly with Peter's letter. He's been telling Christians how to live in plain view of the unbelieving world. Now he goes into the church and tells us how to treat each other. It's his hope that an exhibition of real, Christian love will provide a base of satisfying fellowship for us and attract unbelievers. But how? Faith is not neutral. It’s a powerful and dynamic force that changes behavior (if it is genuine faith). Unbelief is also a powerful force, and when believers try to live out their faith in an unbelieving environment, there are some predictable and unavoidable results. Let’s consider four truths from Peter’s pen that will be helpful when God’s holy people meet up with a hostile world. A Reason for Every "Ouch!" Perhaps the most common word in our language is the tiny word, "Ouch!" Every day, it's repeatedly expressed in variant forms around the world. It's a word that conveys pain and suffering. Peter’s audience knew all about suffering, but they didn't always know how it could actually be used for anything good. Christ's own sufferings provide the best example of both the power and usefulness of suffering. In every war, strategy plays a role. Each side plans and makes movements in accordance to what it learns about the other side’s tactics. If information is leaked, a counteroffensive can be launched. This can be seen in the grand and most profound war of the universe: The Invisible War. In this battle, Satan and his minions wage war against God, His angels, and His people. We’ll consider it by looking again at one of the most enigmatic texts in the New Testament. Let’s unravel it. Should I Get Soaking Wet? So what's the deal with baptism? Why do Christians practice it? What does it have to do with my relationship to God? Peter raised the issue of baptism in this letter, but he tied it into what happened during the time of Noah and the great flood. What on earth could one have to do with the other? Let's unravel these verses and then relate them to our current understanding of Christian baptism. Does this really save a person? Just Counting Time or Making Time Count? There is a certain amount of time allotted to us all, and we all decide how we are going to spend it. But none of us knows exactly how much of it we have left. So a huge question for all of us is: What will you do with the time you have left? Some never face that issue honestly, thinking that they'll always have plenty of time. Today, let's consider four solid principles that will make the time you have left really count. People have been predicting the end of the world since the beginning of the world. But Scripture declares there will be an end. For some, their world could end this week or this year when death pays them a visit. But with whatever time we have left, we should live with a sense of imminence and anticipation that God's kingdom is around the corner. What elements can make our lives stronger as we await the end of the age? Pain and suffering dominate our world. To some, that poses an insurmountable roadblock to faith in a good and loving God. How can a loving God let such unlovely things happen all around the globe every day for millennia? Not only is this a deal breaker for unbelievers, but it presents a quandary for believers who want to make sense out of everything in life. The apostle Peter weighed in on these issues in a very personal way to his fellow Christians. "The church needs leaders who serve and servants who lead." So said one notable pastor. Peter doesn't address just the suffering flock of believers in this letter; he also has encouragement for the leaders of the flock—the pastors. What are the characteristics of a shepherd who serves among God's flock? What are his responsibilities, and how can a church flourish under such leadership? Here, Peter places himself and fellow shepherds under the microscope. One website I came across recently stated that "the more in control you are of your life, the more assured and confident you'll become." The same website warned readers to not trust others. That is, unfortunately, the by-product of our proud world. But walking among others means we sometimes need to bend low in humility for the sake of solidarity and unity. Peter's words on this are timeless. Just think what would happen if a lion from our local zoo escaped and was wandering around the park, looking for a fresh kill. Can you imagine the pandemonium that would erupt if such a misfortune occurred? Imagine no more! Our Enemy is far more dangerous and formidable and is on the prowl to destroy the spiritual lives of the residents of planet Earth, especially those who belong to Christ. Let's consider the battle and the potential outcome. Peter ended his letter with a few nuggets of distilled truth. In just a couple of verses, he concentrated everything he had already said. To his suffering audience, Peter offered assurance of God’s perfect plan that began when they trusted in Christ and wouldn’t end until they were firmly secure in the glories of heaven. Though pain is part of the process of perfection, the finish line is worth it! To build a home or a commercial building requires having the right people and the right materials in place. There is a critical path for the work to follow. And there are blueprints and building codes for the builders to follow. It's the same when it comes to building a spiritual life. As Peter began his second letter, he spoke to the need of spiritual growth. To build a "forever faith," Peter shared four important principles to build successfully. Peter lived his life knowing the brevity of it. Here, he wrote as an older man in his seventies. Realizing there was more road behind him than ahead of him, he gave a model for us. Essentially we have here an excellent example of how to live well and how to die well. Let's answer the question How can I live and die well? by considering four keys passed along by Peter himself. Is It True? How Can I Know? Truth is a slippery word. Definitions get assigned to it that are contradictory, purely individual, and without any validation. Peter wanted his readers to know things. He was giving them truth that was both personally familiar and prophetically verifiable. How can we today know that what we believe in and hope for is actually true? Counterfeiting has become a multibillion-dollar industry that extends all around the world. Fake jewelry, fake purses, fake paintings, and, yes, even fake medicines are sold as if they’re the genuine articles, when they are cheap (though amazingly real-looking) imitations. It’s the same when it comes to truth. What makes a false teacher of false teaching? Peter gave three recommendations in dealing with such counterfeits. The quality, comfort, and success of a journey depend largely on the conditions of the road, the company you keep, and the destination you’re heading for. False teachers and their devotees guarantee a perilous voyage and a bad finish! Today we are challenged to live cautiously as we make progress in our journey of faith and to watch out for ruts. The second coming of Jesus Christ will be the greatest day in humankind’s history. The promise of His return to rule the world He created has been what believers have longed for the last 2,000 years. Jesus’ return will be the solution to every social, moral, political, and spiritual issue and problem. But what do other people (besides Christian believers) think about such a notion? And, as we wait for His return, what should we look for, and where ought we to be looking? We have studied both letters of Peter and have seen how anyone whose life would otherwise be weak, wobbly, and failure ridden can become Rock Solid through Christ. This is vital since life in this world is dynamic, shifting, and transitory. This world is passing; its glory is fading. Thus, anyone who places all their energy and hope in this life alone will be disappointed. Today, as we end our series, we consider where we are eventually headed and how to arrive safely. There are 36 messages in this series.